On Wednesday, February 6, 2013, the opening day of the 2013 State Energy Outlook Conference, assistant secretaries from the U.S. Department of Energy (DOE) described the need for an enhanced relationship with State Energy Officials and state research institutions. 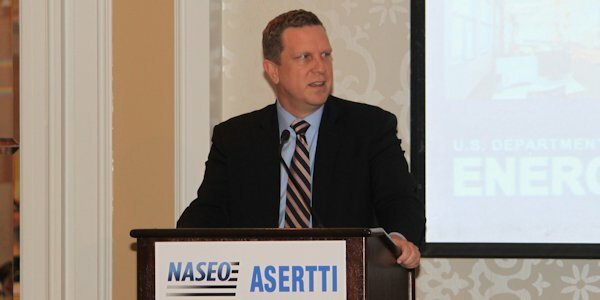 David Danielson, Assistant Secretary of the Office of Energy Efficiency and Renewable Energy (EERE), stated that DOE’s partnership with the states is essential for the country to advance new energy technologies. Dr. Danielson also called for a significant strengthening of the relationship with states and proposed a joint EERE, NASEO, and ASERTTI summit to hold in-depth discussions regarding joint strategies, especially regarding clean energy manufacturing competitiveness. Building on Dr. Danielson’s theme, Patricia Hoffman, Assistant Secretary of the Office of Electricity Delivery and Energy Reliability (OE), encouraged further collaboration with the states in several priority areas. Assistant Secretary Hoffman cited DOE’s strong partnership with the states in energy assurance planning and called for stronger coordination moving forward, especially with the increased frequency and severity of extreme weather events. Ms. Hoffman also proposed ongoing conversations with the states regarding grid integration and cyber security.